Defend your right to be creative! Finished project measures 13" x 18"
Large, heavy paperboard shields to paint and decorate with symbols of your choice, from medieval knights to African warriors. 13" x 18". These are great for children but I suggest you order early. This is the first time in many years I have had a problem with this company normaley they are great to work with but it took over a month to get these and when they came it was after the event we needed them for. I had an issue with a customer rep telling me wrong information as well and that again has never happened in the years that I have used this company. The supervisor Hedi did take care of me getting a return label to send back but it was a disappointing experience. Merchant response: Our customer's feedback on their product experiences is vital and it helps us to identify problems. Your comments have been forwarded to customer service and the product team for review. I use these for my 6th graders. They have to create a family crest for a King Arthur unit. They are a good size and quality and work great for this project. These shields are great for large groups. They are easy to decorate and we have attached handles and also have attached pop tops to hang them to make them coat of arms style craft. 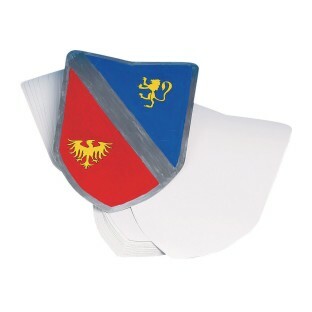 These shields were a perfect craft for our elementary school carnival. The children had fun creating their own designs and taking home a great item for creative/dramatic play. The only con with this product is that handles are NOT included. We easily made tagboard handles and attached them with brass paper fasteners after they were decorated. This craft is a little time consuming so keep that in mind if planning for use at an event. The children easily traced shapes onto the shields using our own stencils and colored them with markers. I am sure that paint would work well on these we wanted to make these quickly without drying time. This is part of a cross curricular project for a King Arthur unit-my kids create a family coat of arms.